1. Make sure that the anastomosis is tension free. 2. Check integrity of the anastomosis: place methylene blue in the bladder via urinary catheter or give intravenous methylene blue. There should be reflux up the stent. Identification of blue dye leakage can identify portions of the anastomosis that may need reinforcement. 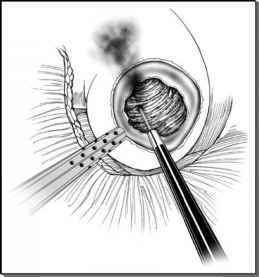 Endopyelotomy, either antegrade or retrograde, may be used to treat stricture of the ureteropelvic junction. Ultimately, open dismembered pyeloplasty may be necessary to treat recalcitrant secondary ureteropelvic junction obstruction.